The 39 Articles form the basic summary of belief of the Church of England. They were drawn up by the Church in convocation in 1563 on the basis of the 42 Articles of 1553. The Ninety-five Theses or Disputation on the Power of Indulgences[a] are a list of propositions for an academic disputation written in 1517 by Martin Luther, professor of moral theology at the University of Wittenberg, Germany, that started the Reformation, a schism in the Catholic Church which profoundly changed Europe. Art piece from the reformation. panel painting by the German Renaissance master Albrecht Dürer. It was finished in 1526, and is the last of his large works. 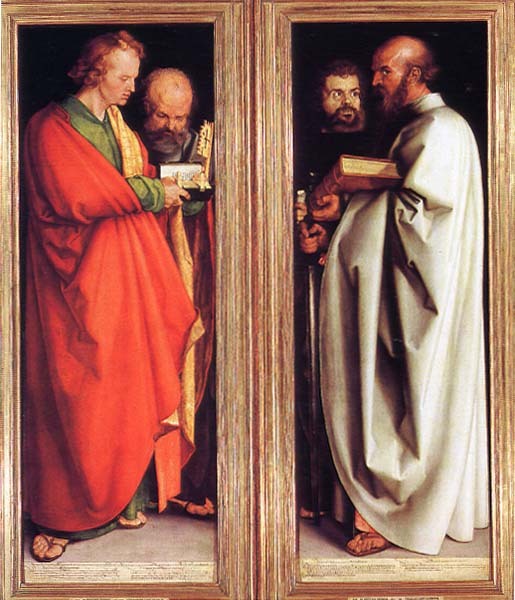 It depicts the four apostles larger-than-life-size. The Bavarian Elector Maximilian I obtained The Four Apostles in the year 1627 due to pressure on the Nuremberg city fathers. Since then, the painting has been in Munich and, despite all the efforts of Nuremberg since 1806, it has not been returned. Art piece from the reformation. After Luther's objections to large public religious images had started to fade, Lucas Cranach the Elder, along with his son and workshop began to work on a number of altarpieces of the Last Supper, among other subjects.